Crème Brulee and flan (crème caramel) are the two most favorite custard desserts to end a delicious meal. Both these dessert custards have their roots in Europe, and are not popular the world over. They basically have the same formula of ingredients and impart almost the same flavors, and so that makes it hard to distinguish between the two. There are, however, some key differences, mainly with the ratio of ingredients, the preparation method, serving method and additional components such as toppings and coatings. Crème Brulee is a baked custard dessert thickened with cream, egg yolks and vanilla extracts. But these ingredients may differ. Other dishes may have the cream and egg yolk as thickeners. The dessert is prepared in a pudding-like custard base while sugar is sprinkled and broiled with a torch to form a hard caramelized layer on top of the custard. The end result will be silky smooth, rich and sweet custard with a glossy texture ready to end a delicious meal. Crème Brulee basically uses a combination of heavy and light creams, egg yolks, sugar and vanilla extracts. 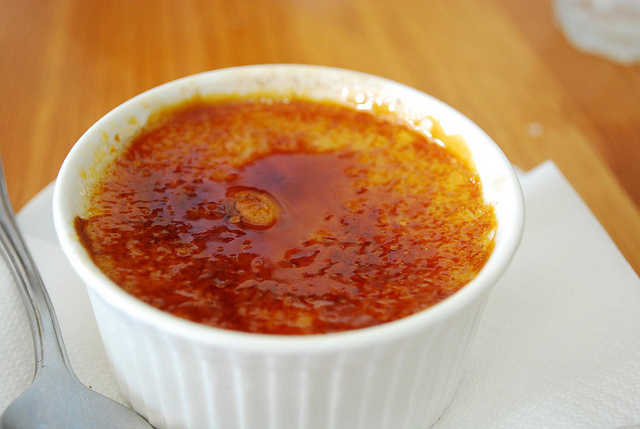 The name crème Brulee is actually French for “burn custard”. Crème Brulee is, however, a complex recipe just like flan (crème caramel). An amateur cooker must expect to take from 3 to 5 hours to excel in it. As one gets used to it, it may take even less than 2 hours to complete the preparation. The usual ingredients of crème Brulee include 1 ½ cup of a heavy cream, a cup of light cream, ¼ cup of sugar, a teaspoon of vanilla extract, and large eggs. The other name for flan is crème caramel – custard made of cream, milk, sugar and egg yolks while baked in ramekins lined with caramel sauce until it has a soft texture. The main difference lies in the ratio of ingredients which is important to avoid compromising a rich texture and identity of the custard. Too much sugar, for instance, can compromise the texture, and so are too much cream or milk and egg yolks. The preparation of flan, like crème Brulee, can take much of your time, so expect to take several hours to master the dessert. Basically, the ingredients include ¼ cup of water, a cup of sugar, ¼ teaspoon of cinnamon, 1/8 teaspoon of nutmeg, ½ teaspoon of vanilla extract, and large eggs. The ratio of ingredients may differ from one dish to the other. These custards are mainly cooked under a gentle heat while being baked in a preheated oven. Much of the details are explained in the aforementioned recommended YouTube videos on how to cook these dessert custards. Crème Brulee is basically made of cream, egg yolk, sugar and vanilla extracts and flan (cream caramel) also made of cream or milk, vanilla, sugar and egg yolks. The ingredients are generally identical but differ in proportion when preparing these desserts. The toppings and coatings also differ. They are all thickened with egg yolks. It is the toppings that mainly differentiate crème Brulee and crème caramel (flan). For instance, flan is characterized by a soft caramel layer on top while crème Brulee has a hard caramel layer created by the addition of a torched or broiled sugar that leaves crust. These toppings may, however, vary depending on the cultural origin of the deserts if it is, for example, Latin American or French cuisine. The texture of the custard desserts also set them apart. Crème Brulee has a delicate layer of caramel. The way it was prepared with cream, vanilla extra and egg yolks while baked in a pudding-like custard base gives it a unique texture. It gets refrigerated afterwards and the sugar is sprinkled and broiled with a torch to give it a caramelized texture. 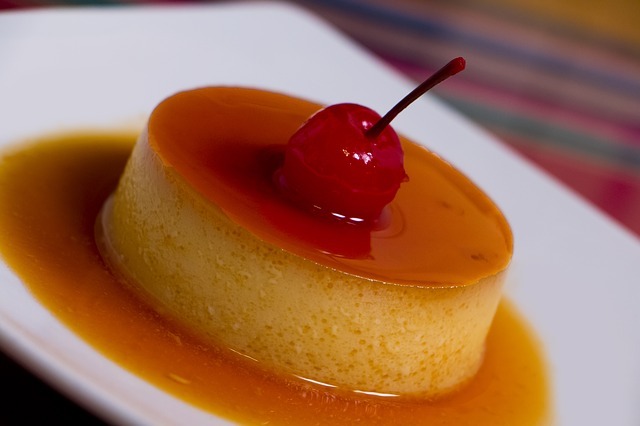 Flan, on the other hand, has been prepared with egg yolks, vanilla, milk or cream to give it a soft caramel layer. Its texture may also depend on its origin. For instance, a European flan may be topped with a caramelized sugar while a Latin one is immersed in milky caramel syrup. While the desserts are made of the same ingredients, they mainly differ in toppings or coatings and in preparation methods. Lusi Madisha. 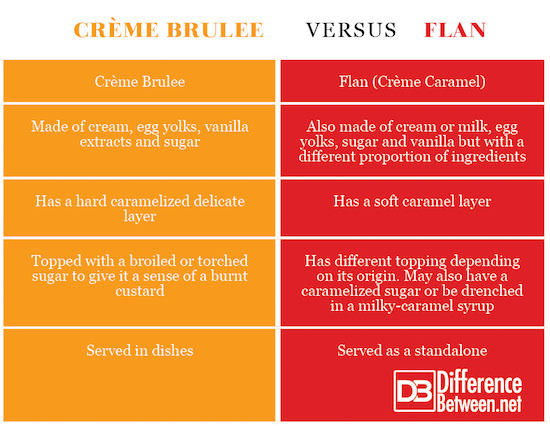 "Difference Between Flan and Crème Brulee." DifferenceBetween.net. July 23, 2018 < http://www.differencebetween.net/object/comparisons-of-food-items/difference-between-flan-and-creme-brulee/ >. I think I’ll stick to making an Angel Food Cake and not open the oven that I bake it in so that it doesn’t de-stabilize and become something else! Think there’s a typo in the first paragraph. Should be “…are now popular throughout the world.” instead of “…are not popular”. Doc Thompson (Dec 6, 2017). What’s the difference between crème brûlée and flan? Accessed at: https://www.theblaze.com/video/watch-whats-the-difference-between-creme-brulee-and-flan. Accessed on: 28 June 2018. Susannah Chen (Dec. 13, 2014). Everything You Ever Wondered About Dessert Custards. Accessed at: https://www.chowhound.com/food-news/158647/everything-you-ever-wondered-about-dessert-custards/. Accessed on: 28 June 2014.